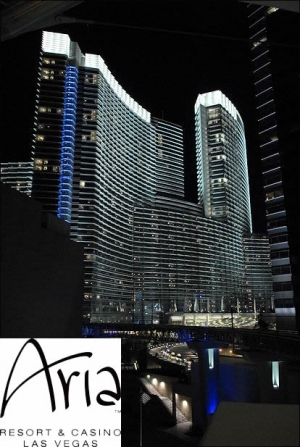 Aria Las Vegas Resort & Casino was designed by the world-renowned firm, Pelli Clarke Architects. Aria Las Vegas is truly a work of art. Its outer beauty is only the beginning of the wonders that await guests of the resort and casino. The Aria hotel features 4,004 guestrooms, including 568 suites, with panoramic floor-to-ceiling windows through which guests can experience breathtaking views of Las Vegas' stunning skyline. Each of Aria's luxurious hotel guestrooms include custom furnishings, unparalleled amenities, and their exclusive one-touch in-room integrated technology. The integrated in-room technology allows guests to adjust room features, including dimmable lighting, room temperature, television/video systems, music, wake-up calls, and draperies to their liking with the touch of a button, customizing the space in a truly personal way. With living spaces ranging in size from 520 square feet to 7,000 square feet across 61 floors, guests are sure to find the ideal room to meet their every need. The Sky Villas at Aria Las Vegas puts at the top of the world in one of the most modern and luxurious hotel rooms in existance. The y range from 2,000 to 7,000 sq.ft. Beautiful accommodations aren't the only thing the ARIA Las Vegas resort and casino can offer guests. The ARIA has assembled a mouthwatering collection of fine and casual dining restaurants backed by some of the world's most critically acclaimed chefs and restaurateurs. With eight fine dining options available, encompassing Asian, Italian, Contemporary American, and the ever popular steakhouse, there is something for every palate. Perhaps you're looking for something a little simpler. The ARIA also features eight casual dining establishments, to satisfy those cravings for a simple sandwich, gelato, pastries, or coffee. For the late night types, the fun doesn't have to end after dinner and a show. The ARIA offers several spots to hang out and enjoy the nightlife. Whether you're looking for something mellow and low-key or energetic and fast-paced, ARIA has just the place the suit your mood. Feeling the need to dance the night away, drop into the Haze Nightclub. Looking for a swanky, sophisticated cocktail lounge, try the Deuce Lounge. Not entirely certain what you're in the mood for, feel free to explore. After all, the ARIA features a distinctive mix of bars and lounges, each offering a wide range of signature libations. Enjoy your evening out. View Bar at Aria Las Vegas' prime location makes it the perfect place to kick-off an evening in CityCenter or relax after a day of shopping at Crystals. Bar Moderno at Aria Las Vegas allows you to enjoy masterfully crafted cocktails and live entertainment in a welcoming and refined atmosphere. City Bar at Aria Las Vegas is a full-service bar that keeps you in the center of the excitement. Lounge comfortably while mingling with friends, both new and old. Pool Bar at Aria Las Vegas is where outdoor sun meets outdoor fun at this casual bar featuring everyone's favorite pool drinks. Open seasonally. What would a trip to Vegas be without taking in a Las Vegas show? The ARIA resort in conjunction with Cirque du Soleil presents Viva ELVIS, an amazing fusion of dance, acrobatics and live music. Created as a tribute to the King of Rock and Roll, Elvis Presley, the show traces the significant moments of Presley's life as he rises to become one of America's greatest musical icons. Suitable for audience members as young as 5-years-old, Viva ELVIS is a must see for any Elvis fans or those that love the beauty and artistry of Cirque du Soleil. Crystals at CityCenter is located right next door to ARIA Las Vegas. It serves as one of the truly unique shopping and entertainment districts in the world! Under its crystalline, glass-and-steel canopy, you'll find find stores that carry items and products from the world's most elite brands including Tiffany & Co., Louis Vuitton, Ermenegildo Zegna, H. Stern, Bulgari, Cartier, Paul Smith, Kiton, Tom Ford and de Grisogono. Conveniently located inside of the Shops at ARIA, Elements offers a variety of ARIA merchandise as well as the everyday necessities. You can also find an assortment of gift offerings from the architects, designers and artists represented in ARIA and throughout CityCenter. From contemporary brands and eco-friendly apparel to snacks, beverages, spirits, and wine, Elements has just what you're looking for. Looking for the perfect accessories to show off in Las Vegas or to add to your already impressive collection? Then you need to visit Papillon located inside the Shops at Aria Las Vegas. Browse through an eclectic assortment of handbags, belts, scarves, jewelry, sunglasses, and gifts, highlighting emerging designers. Papillon is the perfect place to find that perfect accessory. Artistic fine jewelry and luxury watches are delivered in a spectacularly designed environment. Radiance, located insode the shops at Aria Las Vegas, presents hard-to-find collectibles, brilliant treasures and unique timepieces with a focus on modern aesthetics. Hit the town in style! For women, Terrene carries fashion from all categories for today's modern woman. Featuring European and American sportswear with a focus on casual, contemporary and advanced designer collections, Terrene highlights the newest introductions in fashion. The shoe salon emphasizes comfort and style while the trendy jewelry, accessories and cosmetics are the perfect finishing touch to any outfit. Seasonally, Terrene also offers the hottest swimwear perfect for fun-filled days in the sun. And the intimate apparel can serve as the ultimate gift for her. Viceroy features European and American high-end tailored clothing along with an assortment of designer and contemporary sportswear for men. In addition to fashionable shoes, sports watches and trendy jewelry, you can also find a broad range of accessories, with a focus on versatile and travel-sensitive products. Viceroy also offers a range of niche personal care items including shaving, fragrance and skincare products. The Bristlecone Ballroom - Located on level one. 51,560 sq. ft. Can be divided into 10 sections that range from 2,040 to 17,135 sq. ft. The Pinyon Ballroom - Located on level one. 38,300 sq. ft. Can be divided into 8 sections that range from 1,968 to 11,600 sq. ft. The Ironwood Ballroom - Located on level three. 38,800 sq. ft. Can be divided into 8 sections that range from 1,968 to 11,600 sq. ft. There are 36 meeting rooms located throughout the three levels of Aria's convention area. The square footage ranges from 840 to 3,912 square feet. The two executive boardrooms reside on Level Three. When in Vegas, it's not just all about the fun angames. With some of the most exclusive spas in the world, LasVegas is also a destination for those looking for a little R & R. Aria Las Vegas has now added another elite spa to the list. So when you're ready to get away from it all, The Spa at Aria offers you a lavish way to unwindand to re-energize yourself for all that ARIA has in store for you. Come and relax on heated-stone ganbanyoku beds. Breathe the fresh air of our infused salt room. Let your stress melt away in separate men's and women's spas with eucalyptus steam rooms and redwood saunas. Sounds too good to be true! If you're just not ready to experience the spa, you can get a work out in at their fitness rooms and group exercise studios. Enjoy massage therapy and skin care treatments from around the world. Then mingle on Las Vegas' only co-ed balcony pool with a stunning view of our beautiful pools.